The Color Issue: It's a Reader Appreciation Giveaway & I'm part of the bunch! It's a Reader Appreciation Giveaway & I'm part of the bunch! Where would all of us bloggers be without our faithful readers? We honestly might not keep up with our blogs and disappear from the blogging realm of the world. We want to say thank you from the bottom of our hearts for faithfully reading our blogs and for your constant source of encouragement through emails, comments, social media interactions and support you've shown us. This giveaway was created with you in mind and we are so excited about it! You are going to have the opportunity to win one of nine amazing packages from one of us! Below you will find mini-posts from all nine of us letting you know what our favorite products or trends are right now and also what you will have the chance to win from us. It's Jessica Rowe from [The Aestate]. I love Diptyque Candles. I love them because they're such a nice little luxury. They're made with natural essential oils that smell so much better than candles made with cheap synthetics. I am giving away one [Diptyque Baies Candles]to one of you lucky readers! Hey y'all! It's Sarah Weaver from [A Beautiful Life]. I love it when I find great beauty products and I always want to share about my great finds. Right now at the top of my list is Urban Decay Primer Potion (eye primer). Using a primer is the only way to guarantee that those pretty shades you wear will stay put and never fade throughout the course of your day. I will be giving away an Urban Decay Primer Potion, Merle Norman eyeliner, C.O. Bigelow Mentha Lip Gloss and Bath & Body Works anti-bacterial hand gel (a must have for every germ-freak). Oh and I can't forget a pair of some super fun [earrings] from H&M! Good luck ladies! Hi there! It's Laura Podlich from [Beauty & The Beard] and I love all things polka dots and bright and bold statement jewelry. J. Crew has some great sweaters out now that you can find [here] that are covered in polka dots. I am especially loving turquoise statement necklace right now like this [one] from Shop Design Spark. Since I do a lot of DIY projects and cover a diverse set of topics on my blog, I put together a fun package with a little bit of everything in it. So, you will be able to win an oversized turquoise pendant necklace, sparkly stud earrings, three bottles of my favorite summer lotions and 3 tubes of my favorite glitters for your DIY projects. Best of luck ladies! Shanna here from [Because Shanna Said So]. One of my favorite products is from OPI. Their Rapid Nail Dry is fabulous. I always take it with me to the nail salon. Spray it on right after you polish and you nails are completely dry in 45 seconds. I won't polish without it. Best nail dry I have found. It's no surprise coming from OPI. One of you lovely readers will be winning this glorious product from me to use! Hey! 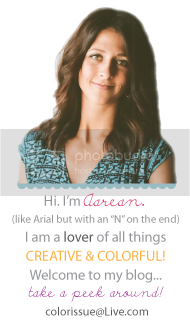 It's Aarean from [Color Issue]. My latest love is [colorful ankle zip legging jeans]. I am LOVING these because they are SO comfy! They're flattering for all shapes and sizes, and they are so super colorful and that's a must of course! :-) I am also loving emerald green accessories which go with practically anything. Mix the leggings in with an [emerald green necklace] and you're good to go. Since I am a graphic designer, I do a lot of custom poster designs. So I will be giving a custom poster design (your choice of quote, colors and size) from [La Ditta Design]! Hi everyone! I'm Angela and I blog over at [Head to Toe Chic]. Two of my favorite trends are [peplum and statement necklaces]. At first I didn't think peplum tops would be flattering, but I was wrong; it just needs to hit you at the right part of your waist. The other trend that I love is how statement necklaces are becoming a staple in everyone's wardrobe. I have way too many to count! They add such a fun element to an otherwise simple outfit. I will be giving away a gorgeous statement necklace, so you can start or expand your collection of these fun pieces. Hello! Brooke here from my blog [Inside-Out Design]. I love that we aren't decorating our houses in a timid way right now; big, [bold prints] are everywhere. The best part is that they can all be mixed together in one room with small scale prints. It makes such a big statement in any room no matter the size and I love attention-grabbing rooms that captivate your eyes. To help you set the mood and create eye candy for one of your rooms, I am giving away two 5x7 prints from [Couture Prints] and a bold zebra print 15.5" x 9.5" pillow sham! Hello lovelies! I'm Jessica and I blog at [Jessica Who?]. I love [31 Bits] jewelry! In 2005, I went on a mission trip to Uganda so the people there still hold a very special place in my heart. 31 Bits is a great organization that provides stability to women in Uganda while producing beautiful jewelry. I love them! I am also in love with [wrap bracelets]. I have incredibly tiny wrists so finding bracelets that don't look ridiculous on me has always been a struggle. Wrap bracelets are perfect for me and I'm so happy they are trending right now! I am going to be giving away a jewelry set from [Ball & Chain] to one of you lucky readers! Hey! I'm Rachel of [Rachel Coletta]. My favorite trend right now is the [contrasting collar] as seen in New York's Fall/Winter 2012 Fashion Week. Many of these collars are actually accessories that easily tuck into sweaters and crewneck dresses - who wouldn't think that's cool!? It's a simple way to make your outfit look a bit more polished, especially when the collar pops out with color. One of you insanely awesome readers will win a [gorgeous gray bubble necklace] from me! Congratulations everyone! Thank for the opportunity to win these amazing prizes. See you on Monday!